Crisp and clean and oh, so cute! Can't wait to see pics of that new grandbaby! But, Gramma, it's so cozy and warm in there!! Ha! This color combo, and that darling gingham is such a wonderful change-up from the usual red or pink of Valentine's Day - could be why I adore it! I love how crisp and clean this is! The gingham background is fabbo and looks great with the red and green. I hope your new grandson doesn't keep you waiting too long! This is such a sweet Valentine Linda! I just love those hearts! Love that buffalo plaid (or is it gingham?) paper! Can't wait to hear the news of your grandson! Oh that is just so exciting!!!! Oh this is just so cute! 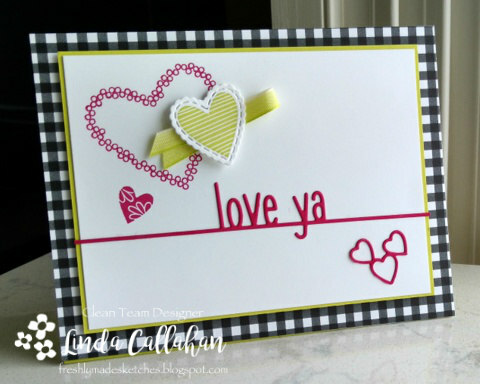 I love gingham and the black gingham with the cute hearts in such gorgeous colors really work wonderfully together. Adorable!!! Love the hearts and that pop of lime is fabulous! This is too sweet! I love this Valentine's Day card with those sweet hearts and the sweet sentiment!